the West Vancouver Fire Fighters Charitable Society. The WVFFCS is a volunteer organization of West Vancouver fire fighters who donate their off-duty free time to raising funds to benefit the citizens in and around West Vancouver. They have participated in United Way campaigns, the Muscular Dystrophy Boot Drive and the Bright Lights event at Stanley Park in December which is organized by the BC Professional Fire Fighters Burn Fund. In 2013 the Society raised more than $27,000 for local programs. However, their marquee event is Bagpipes by the Beach. This will be the seventh year for this great evening, which brings together both competitive and non-competitive pipe bands to perform for a large family-oriented crowd who gather with their lawn chairs and blankets on the grass at Ambleside Park to enjoy the scenery along the shores of English Bay and a great spring evening of pipe music. 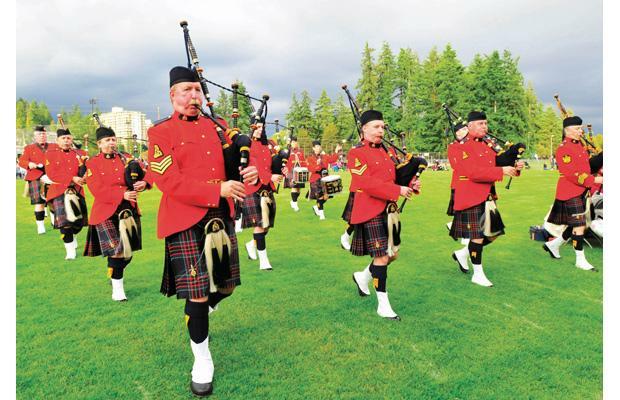 The RCMP E. Division Pipe Band will be performing, along with J.P. Fell Pipe Band and the newly formed Surrey Fire Fighter’s Pipe Band.